NEW YORK — Platinum-selling rapper Tekashi 6ix9ine has been charged with being part of a vicious street gang that pushed drugs and shot numerous people, including an innocent bystander at the Barclays Center earlier this year. The 22-year-old rapper, whose real name is Daniel Hernandez, was one of five alleged members of the Nine Trey Gangsta Bloods, a brutal Brooklyn street gang, charged in a federal racketeering indictment. He faces up to life in prison if convicted. At 6ix9ine’s arraignment, the judge deemed him a danger to the community and a flight risk and ordered him held without bail. U.S. Magistrate Judge Henry B. Pitman noted that there was “troubling” evidence offered by prosecutors that showed that 6ix9ine directed or participated in multiple acts of violence over the last eight months. “The defendant is quite violent,” prosecutor Michael Longyear said. Longyear said 6ix9ine was captured on surveillance video sitting in a car and filming his co-defendants carry out a violent robbery against a rival gang member in Times Square. 6ix9ine also was caught on video boasting about shots recently fired by a co-defendant inside the Barclays Center, home of the Brooklyn Nets, Longyear said. The rapper’s lawyer, Lance Lazzaro, said his client had fired some of his co-defendants as part of his management and security team last week and was offered protection by federal agents on Saturday after some of them were overheard on wiretaps threatening his life. 6ix9ine refused the offer, Lazzaro said. 6ix9ine’s album “Day69: Graduation Day” was among the top records on iTunes following its February release. He is known for the multiplatinum hit “Fefe” with Nicki Minaj, which peaked at No. 3 on the pop charts, and “Stoopid,” featuring the incarcerated rapper Bobby Shmurda. 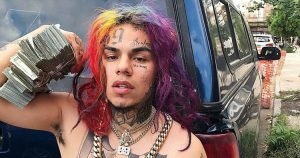 But 6ix9ine also has had a series of run-ins with law enforcement and has publicly identified himself as a member of the violent Bloods gang. 6ix9ine recently pleaded guilty to disorderly conduct in Brooklyn in connection with a May traffic stop.